All week my team kept telling me, “make sure you don’t count the ‘Mississippis’!” I’ll admit I didn’t get it at first, but thank goodness the team at Dancing with the Stars took good care of me so I didn’t end up looking like Ross. Len mentioned that the rumba can be the kiss of death for male competitors, because you have to showcase your hip action and fluidity. You’re balancing light and shade. (I’m amazed these words are part of my vocabulary now when I describe movement!) Kym put together a stunning routine to Ellie Golding’s “How Long Will I Love You,” and the audience saw how moved I was in rehearsal—even Sharks can shed a few tears every now and then. I was determined to beat last week’s scores and really own the genuine emotion of this performance. We came away with three 7s and an 8, and #TeamSharkaroo is officially on to week 4!! Next week we waltz to a song that represents my most memorable year. Last night was extra special for #TeamSharkaroo because we had some added support in the ballroom. Kevin O’Leary and Lori Greiner stepped out of the Shark Tank to cheer us on, and despite calling me a chicken this week—yes, I haven’t forgotten, Kevin!—they were rooting us on every step of the way. I could hear Lori screaming from the edge of her seat. Thanks for being there, guys! I also had special guest Daniel Wang and his family join me for the show. I first met 17-year old Daniel through the Cancer Kiss My Cooley organization. We spent a day together in Chicago last year. After surviving a 3.5 year battle with brain cancer, Daniel has undergone weekly speech therapy to control his voice and breath, and physical therapy to learn how to walk again. The use of his right arm has never returned. We have kept in touch over the past year, and when the announcement came that I was on Dancing with the Stars, Daniel’s was one of the first emails of congratulations and well wishes that hit my inbox. We had a blast walking the trailers and introducing Daniel and his family to the cast and crew last night. I’m so grateful for this young man’s friendship. He always tells me that Shark Tank motivates him to fulfill his American dream, but he so obviously motivates everyone around him. He’s polite, witty, energetic, and has a passion for life that is absolutely infectious. Thank you for celebrating with us, Daniel, Millie, and Daphne. How has your body changed since being on the show? Dancing is an incredible workout! Honestly. My posture, my upper back and my shoulders have been transformed. I expected this to burn my legs (and don’t get me wrong, they’re in pain)—but the upper body transformation is outstanding. How do you stay so positive when the judges are critiquing? It’s important to not take critiques negatively. I am a Shark out of water (Flipper—right, Bruno? ), and I want to be better every time I step out on the dance floor. I need to listen to Kym and the judges because I’m in the middle of the pack right now, and really need to improve next week in order to stand out. 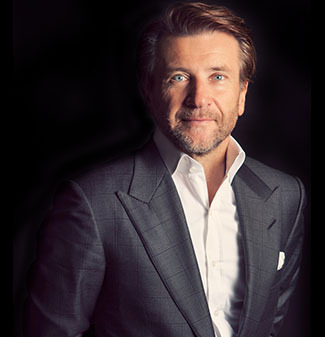 If you’ve got questions, send them my way via Twitter to @robertherjavec and tag #TeamSharkaroo. Thank you all for your support!! Keep the votes coming for #TeamSharkaroo by calling 1-855-234-5609 or through Facebook. Originally posted from EW.com on March 31, 2015.